I considered writing a review of the first episode new season of Game of Thrones for this week’s post. Or course I watched it and am eagerly awaiting the rest of the episodes. It’s interesting finally being in the dark about events since the show has now surpassed the books. But there have been enough reviews, predictions and talk about where the show is headed, I didn’t think it warranted my attention. In fact, I’ve actively been trying to stay away from anything discussing GoT, since I don’t want other people’s theories to potentially spoil the show for me. Instead, I’m going to write about a show I have recently started watching. There have been a lot of spy programmes throughout the years. Some have been funny, some have been plain dumb, some have been action-based and some have been dramatic. I’ve watched some of them, but by no means all. It’s an interesting niche genre in television, but by no means my favourite. I have, however, started watching The Americans. Set in the early 1980’s in and around Washington DC, it follows the lives of two deep-cover Soviet spies living in America (played by Keri Russell as Elizabeth and Matthew Rhys as Philip Jennings. Why they cast Rhys, a Welsh actor, to play a Russian/American spy is beyond me, but that’s Hollywood for you.) It’s the height of the Cold War, where tensions between the US and Russia are the tightest they’ve been in decades. Not even Elizabeth and Philip’s two children, both born in the US, know they’re spies. To make it even more interesting, a new member has just joined the FBI counter intelligence division and, coincidentally, moved in across from these two spies. Suddenly the stakes have been raised, for all involved. The stories are a bit unbelievable in the sense that Elizabeth and Philip always seem to be in the right place at the right time with the right equipment to get the job done. Their disguises never come off, either, and they never raise suspicion from their two children about why they’re out all the time. 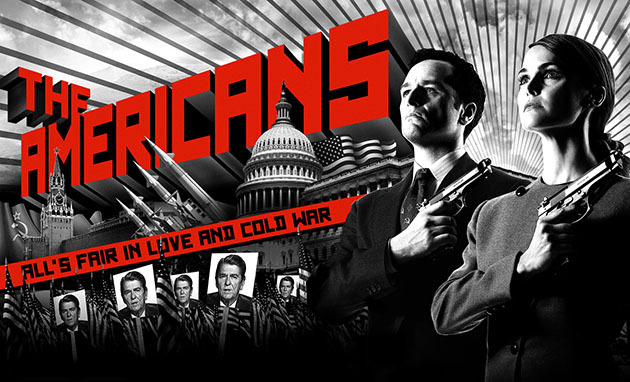 Suspending the usual disbelief necessary for any crime type show, I’m intrigued by The Americans. Specifically, I don’t know whether I’m supposed to be rooting for Elizabeth and Philip to succeed in their mission. Now, history says America won the Cold War, but it wasn’t always so obvious back then. There were real fears about the potential for nuclear war, and talk of Reagan’s ‘Star Wars’ missile defence shield must have struck terror in many Americans and Russians alike. As an historian, then, I know that the Jenning’s will fail to bring down the American government and win the Cold War. As a viewer, though, they’re slightly more sympathetic. They are still horrible people — murderers, liars and philanderers — but they’re fighting for a cause they believe in. All while trying to protect the children they obviously love and, of course, not get discovered. Despite these flaws, they’re still somewhat interesting as think-pieces. I can’t recall another show where the protagonists are also the antagonists. Having grown up in the West with its trappings of capitalism and democracy, I’m supposed to love America. I’m supposed to hate the evils of Communism — its total dominance of the people and production, the lack of freedom, the lack of religion, it’s big, scary army. Whilst these themes show up in the show, it’s never that clear-cut. Elizabeth and Philip have been living in the US for over 15 years and so have become used to American society. Philip has started to enjoy it — perhaps too much, in Elizabeth’s eyes. Elizabeth, however, still loves the homeland above almost everything (except her kids, it seems) and will do anything to accomplish an assignment. That the show’s creator, Joe Weisberg, worked for the CIA in the early 1990’s should add some sort of authenticity to the show. I’m not sure if it does, as I have never worked for the CIA or FBI, but that factoid in itself is interesting. He would have colleagues who might be able to tell his stories about the sort of activities spies in that era would have done. He could even still have access to documentary evidence and be basing everything off real events. It’s not like the CIA or FBI would every admit to having lost agents due to enemy activity decades ago. Neither agency has ever been known for its transparency to the country, after all. It’s not a great show, but it’s an interesting watch. I don’t need to be deeply invested in every minor plot point thinking that it might become important later like I was with The Wire or Game of Thrones. I’m sure, if I looked deeper, I could find something to analyse in terms of cultural commentary. So far as I can tell, however, that’s not the point of the show. It’s entertaining, which is all I want it to be. This entry was posted in Popular Culture, Reviews, Television and tagged Corruption, Game of Thrones, HBO, NSA, Paranoia, Popular Culture, Reality, Review, Social Commentary, Spying, Television, War, Writing. Bookmark the permalink. I would say capitalism also have its ways of “total dominance of the people and production”. But that is not the point here anyway. Have you tried TURN Washington’s Spies? Yes, I’ve seen the first season. It was decent, and I’ll watch season two at some point. Definitely a different type of spy story. Thanks for the recommendation.